When the summer or winter months approach, extreme temperatures become very commonplace, and this is when the thermostat gets important. 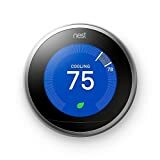 The ability to touch the thermostat in television programs is often reserved for the boss of the workplace or the head of the household, with any fiddling with the thermostat leading to an upset controller of the thermostat. In the past, keeping the temperature just right for everyone was a challenge, but in the modern world, smart thermostats such as the Honeywell thermostat that we’ll review have changed this. Smart thermostats are the new trends in temperature control. 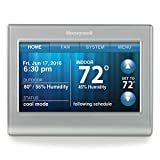 WHAT IS THE HONEYWELL THERMOSTAT? In this article, we’ll explore the Honeywell thermostat smart WiFi model in addition to three others to present a general understanding of how smart thermostats work and which ones might be best to suit the needs of your home or workplace. The Honeywell thermostat smart WiFi model is capable of providing you with 24/7 comfort through the intelligent control of your climate. Keeping the temperature comfortable and in a zone that is pleasing to all can prove to be a challenge. The temperature you’d prefer it to be during the day may be quite different than at night, and the morning can be an entirely different story. Old style thermostats require manual settings, and for adjustment, must be manually altered. Smart thermostats such as the Honeywell thermostat we’ll be reviewing in this article have changed all of this. The Honeywell thermostat smart WiFi model takes climate control to a new level. 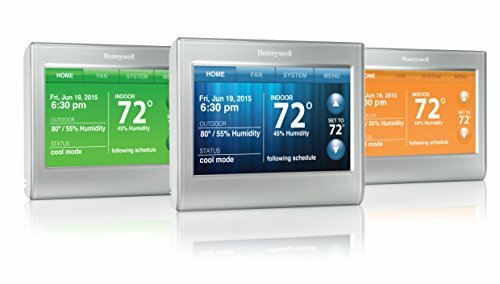 Rather than simply allowing us to adjust the temperature manually over the thermostat, the Honeywell thermostat provides us the ability to program our climate based upon our schedule. The Honeywell thermostat is a wireless thermostat that can be programmed via the convenience of your smartphone. The true value of the Honeywell thermostat becomes apparent when the cost savings that can be realized in terms of heating and cooling through the effective programming of the climate. At the outset of setup, the Honeywell thermostat asks whether the thermostat is being used for business or home use. For businesses, significant energy cost savings can be realized through programming the building to not expend energy when there are no persons in the building and to have the building at the appropriate temperature by the time the building is occupied. If using the screen itself, it is a touch-screen free of buttons, although as mentioned the internet can be used to program the wireless smart WiFi Honeywell thermostat, making programming very simple and fast. 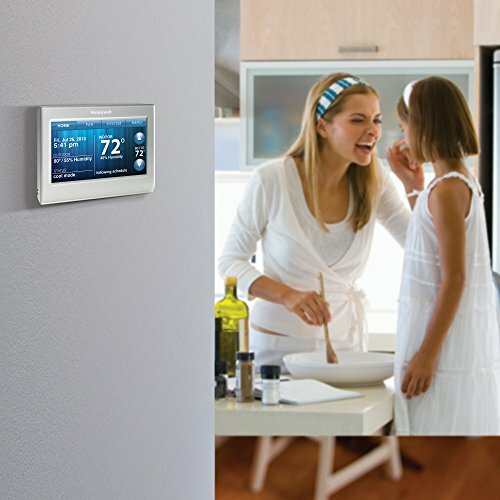 The Honeywell thermostat smart WiFi model is a technologically advanced intelligent thermostat. The thermostat has “smart response technology”, which tracks various metrics such as what your preferred average temperature is at a particular time, as well as how long it takes your system to bring your home up to temperature. By learning such information, the thermostat then will customize the amounts of time the system will run to reach your preferred temperature on time, taking into account the function of your specific system and how long it takes to achieve heating or cooling in your building. The Honeywell thermostat relies upon WiFi, and so, of course, you must have wireless internet established in the home. Upon having installed the thermostat, which can be done yourself or with the assistance of a professional, you simply download the “Total Connect Comfort” onto our smartphone or computer, and from there can control the Honeywell thermostat smart WiFi model from the convenience of your Android or iOS smartphone or your computer. There is even a vacation mode that can be programmed well in advance so you don’t forget to cut the energy cost while you’re away. The pricing of the Honeywell thermostat smart WiFi model is available on Amazon, with the other models reviewed all around costing more. 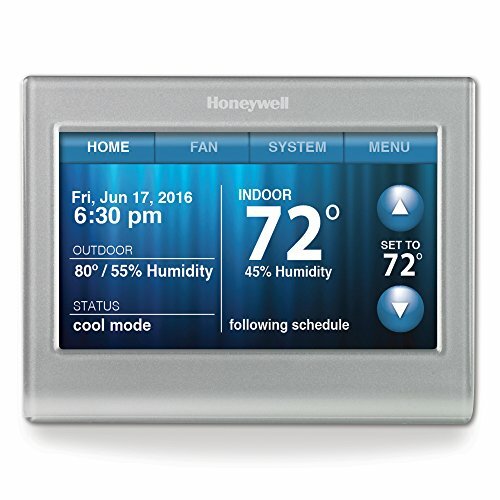 The Honeywell thermostat has the lowest cost of all the models we’ll be reviewing. We picked a few similar smart thermostats available on the market to see how they compare to the Honeywell thermostat smart WiFi model. The Honeywell thermostat smart WiFi model provides application-based wireless control and touch-screen access on the machine for smart climate control to save you on energy costs. Simply install the Honeywell thermostat smart WiFi model into your home, download the associated application onto your smartphone or computer, and from there controlling and programming the temperature is as simple as opening an application and clicking touchless buttons. The Honeywell thermostat when installed personally can present some difficulty as it does not work with baseboard heaters and does not function with all models of heating or cooling systems. Due to this, professional installation is recommended for individuals without much experience or confidence in installing a thermostat into their home, as an incorrectly installed system could be less cost-effective than the former system altogether. With a touch-screen design and a very simple to use application to keep the programming functioning smoothly, the Honeywell thermostat smart WiFi model is of particularly high-quality. The Honeywell thermostat has a 1-year limited warranty. The Ecobee comes fully equipped with Alexa, an intelligent program that is responsive to voice commands so that you can talk to Alexa on your device for completely hands-free adjustments to your temperature. The Ecobee is capable of being installed relatively quickly and easily, with room sensors being used throughout the rooms in your home to determine the actual temperature in the rooms, and from there to adjust the heating or cooling system accordingly. Placing the sensors into whichever rooms you prefer leads to the temperature being balanced and averaged out across your home for maximum comfort. The Ecobee is not only possible to use through your computer or smartphone from the convenience of anywhere with internet access, but can be controlled through voice command. So not only is the machine used on a touch-pad for button-free operation but can even be adjusted entirely hands-free through the use of your voice. The Ecobee is also fully integrated into your Alexa system in your home, so just after you put in a request for your favorite song with Alex, you can then adjust the temperature. The sensors not only measure temperature but occupants, so if you forget to turn off the system when you leave, the Ecobee can adjust it for you to save on energy costs. Assembling the Ecobee can be done in about 30 minutes according to the instructions and requires the installation of the unit, followed by the sensors in the rooms throughout your home. Everything necessary to install the Ecobee comes in the box so no outside purchases or worries are necessary. 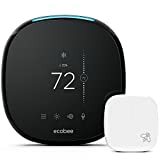 The Ecobee is an independent thermostat and climate control system that can be integrated into your home Alexa system and can be used via an application or even through voice commands. The black and teal color scheme is also very stylish. There does not seem to be any warranty for Ecobee products provided by the manufacturer, so consult with your retailer. Although the company does specify that a customer warranty is not provided for a defective product, Ecobee will either replace or repair the product upon having sent it back to Ecobee for review. The Nest Learning Thermostat is also integrated with Alexa to provide you with WiFi-based temperature control that can also be managed through the use of your voice. Nest has reached the fourth generation of the product, and unlike the competition, comes in 4 different color schemes to match the interior of your home. One of the key advantages of the Nest Learning Thermostat is that just as the name implies, it is capable of learning. The Nest Thermostat observes your habits and learns them so that you begin saving money through automatic adjustments to the temperature that decrease energy costs. Easy to install and integrate into your Alexa system. The design quality of the Nest Learning Thermostat is exceptional. The display is adjustable and meant to provide you with an accessible source of information to adjust your energy expenditures accordingly. The four colors that Nest comes in–copper, stainless steel, black, and white–are suited to match with any interior design scheme, making the Nest Learning Thermostat not only a functional item but an integrated part of your interior design. 2-year limited warranty on parts, not labor. The Glass Smart thermostat monitors the air quality for temperature, humidity, total VOCs, and equivalent CO2 so that your in-home environment is fully customized and controlled, with the machine even reporting outdoor air quality in terms of allergens, air quality index, and UV index. Mobile application connectivity via WiFi although there are no voice commands. Relatively simple to install although it does require drilling. The producer recommends using a professional for installation if uncomfortable with drilling. The design quality is quite high, and measures air characteristics the other systems reviewed are incapable of doing. The clear glass display is also very futuristic. 2-year limited manufacturer’s warranty on parts, not labor. The Honeywell thermostat smart WiFi model is a useful appliance that intelligently improves upon your energy costs and efficiency whether in the home or at work. The other models reviewed are similar, although with room sensors can work with baseboard heating systems and are more convenient with voice command options. The many smart thermostats we have reviewed demonstrate having to get up to fiddle with the thermostat, if you are even allowed to do so, is a thing of the past. For more articles on smart home technology and how to use it, check back to EZ Living Future at ezlivingfuture.com for ongoing articles and updates.